-209: "A Matter of Time"
Of course, this episode is a thinly-disguised advocate for tolerance towards homosexuality, or indeed any sexual orientation. Nicely, we get an alien race & culture with some history and thought behind it, which works well. We also get to visit their actual planet, when logic permits, which helps some of the crew get off of the ship - something they do all too rarely. The early exploration of gender issues are some of the story's best portions. Riker has a hard time finding a gender-neutral pronoun to replace "he" and "she" - time to let the universal translator borrow from Hungarian, and use the uniquely-accented single-letter pronoun pictured at right. Problem solved! I also really like the scene at the poker table, which is a lot of fun. Adding to the weirdness is that Riker actually talks to Troi about the whole thing as though he needs her permission, which only really stands out because he never does as much for any of his other flings, and this week's fling has too many added doubts and questions surrounding chemistry and compatibility to compare favourably against the others. From what little we do learn about this alien species, I'd have to guess they wouldn't be compatible enough to satisfy Riker on a level beyond idle curiosity. Ultimately, it's hard for a formula-savvy viewer to get very invested in Riker's relationship with Culea's character Sorin for its own sake, since we fully expect the reset button to be pushed on it when the hour is over. What investment we have ultimately comes up over the right to make one's own choices in personal matters - a far more archetypal struggle, and the one from which this episode truly draws its real dramatic substance. Well, apparently Riker goes far enough to trigger a social disturbance within the alien society, and then wants to do more and go so far as to violate the Prime Directive for Sorin. Of course, the archetypal sense of injustice has been successfully nurtured in the audience by that point, easily getting us on Riker and Worf's side. But as we narrow our focus to look at how well the Prime Directive helps or hinders us with today's problem, the episode gets vague on a few key areas. First of all, it remains unclear exactly whose territory Sorin was in when she was arrested. Her last scene of freedom is outdoors on the planet, snogging Riker. Later, Riker clearly expects to find her in her guest quarters on the Enterprise, but instead discovers another alien who reveals she's been arrested. If Sorin was arrested on the planet, there seems little reason for the other alien to go all the way up to the Enterprise and wait for Riker in those quarters to report it all to him. It's the kind of thing you'd want to phone in. If, on the other hand, Sorin was arrested while on the Enterprise, a whole slew of jurisdiction questions crop up. You'd have to wonder how her people managed to arrest her and extradite her back to the planet without Riker knowing.... she could have requested asylum then, and have saved herself without any challenge to the Prime Directive. Additionally, the Federation has enough contact with this race to target a nice hole in the logic of their legal system. If they want to maintain that Sorin is essentially sick instead of criminal, this should be a medical instead of a legal problem, and the Federation can say they have an alternative cure (also known as "tolerance"), and dare the aliens to let Sorin choose which cure she wants to try first. If this argument is successful, the Federation could then grant Sorin asylum. If not successful, at least the aliens' pretence of medical concern has had its cover blown, and at that point perhaps the alien society has proven itself too backwards for the Prime Directive to allow the Federation to have significant relations with them at all. A lot of these options come back to point at how much choice Sorin is allowed to have. A sound metaphysical reversal should perhaps also look at how Sorin is creating and maintaining her reality. How much self-responsibility does Sorin show for making a choice and asking for what she wants? She is forthcoming enough to ask question after question to satisfy her curiosity early on, but she is extremely guarded about what she wants. She doesn't even really ask Riker for a relationship; she reveals her feelings and launches into stories of persecution and fear instead, stifling Riker's reply. At no point does she choose or ask for asylum, or any other kind of help from Riker or the Federation. The closest she comes to that is an anxious look towards Riker as she is dragged from the courtroom. Considering how vocal she was earlier during her huge speech, it's hard to believe she would be too intimidated to jump at Riker's offer of asylum if she truly wanted it. Sorin puts her energy and passion into courtroom speeches instead (which Culea performs really well), turning down Riker's other attempt to help with a white lie (nice, since honesty is better), but ultimately not asking for any other kind of help from him. She actually only asks for two things: compassion and understanding, and doesn't really seem to care if Riker and the Federation can give them to her. She wants them from her own people. And that may be just enough inflexibility on her part to prevent the universe from giving her what she wants. All this informs our position on whether the Prime Directive should guide the actions of Riker, Worf, and the Federation at large, as we take our cue from the precedent set down for similar ideas in "The Trial of a Time Lord" (Doctor Who story nos. 144-147). Namely, was their help and/or interference requested? To that I have to say I think it was not. Legally, level-headedly, and metaphysically, the Prime Directive should prevail here. Though this story is great at generating food for thought on gender issues and triggering debate, in the end I think the characters' relationships and interactions get manipulated a bit too much at the end to create a sense of victimhood and injustice to further Jeri Taylor's social arguments, which rubs off on Sorin as though it is the character's strongest motivation as well. And Riker deserves a more invested partner for the level of relationship that this episode seems to want to portray. If this was a Doctor Who story, I think it would climax with a rescue and the pyrotechnical destruction of much psycho-tactic machinery, and I'd get on side with it. But on a show where characters do value the Prime Directive, ultimately I don't feel it was worth the risk of violating their highest values in this case. The story structure didn't quite warrant it, nor did the interpersonal relationship. Did we actually get a Prime Directive violation? I'd say we came close, but missed it by a hair, thanks to circumstance. The ultimate point to get out of the episode is that tolerance is a better road than trying to force others to change to make yourself feel comfortable. That applies to all kinds of issues, not just sexual orientation. If our Federation characters are going to set any good examples of that for Sorin's race, perhaps following the Prime Directive, in this case, is one of the best ways to go. This episode is definitely built on a good gimmick, and it produces a lot of worthwhile scenes, but doesn't quite satisfy as a good Riker story. Features 26 episodes @ 45 minutes each, including both parts of "Unification". Nov. 19, 2013. Blu-ray U.K.
"Cause and Effect" by writer Brannon Braga and moderator Seth MacFarlane. "I, Borg" by writer René Echevarria and scenic/graphic artists Mike and Denise Okuda. "The Inner Light" by co-writer Morgan Gendel and the Okudas. Two-part documentary "Requiem: A Remembrance of ST:TNG" (HD, 59 min. 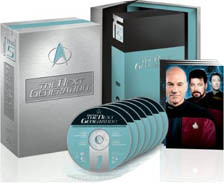 total) with 1981 interview clips of the late Gene Roddenberry, plus Patrick Stewart (Picard), Jonathan Frakes (Riker), Marina Sirtis (Troi), Michael Dorn (Worf), writers Moore, Braga, and Shankar, and executive producer Rick Berman. In Conversation: The Music of ST:TNG (HD, 65 min.) with composers Ron Jones, Dennis McCarthy, and Jay Chattaway, and host Jeff Bond. plus, all featurettes from the DVD version.